Drove back to Red Deer from Lethbridge for the weekend last night and went out west this morning. Seen a good sized deer on a pipeline at 300 yards but only antlered was open in that zone. Got closer to see if I could make out antlers but it ran off when I got to 200 yards. Went over to a zone open for both antlered and antler less and seen a small 3X3 headed down a quad trail. I jumped rock to rock over a stream and managed to keep my feet dry (pretty epic stalk) but it was also an epic fail. After that I was in some diamond willows and some deer got spooked off a near by gravel road and ran into this open pasture. It was a doe and 2 yearlings, one of the yearlings was a fork horn. 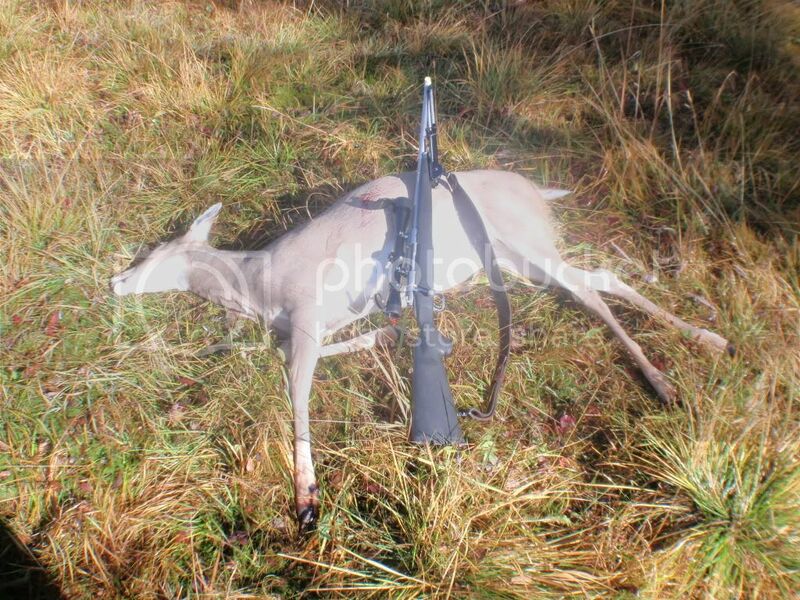 I picked out the female yearling and shot her with the .270 Win. at 100 yards offhand. No reaction she just ran off like nothing was wrong. She headed straight to a clump of willows and stopped. I knew I had to of hit her cause theres no reason for a deer to stop after getting shot at if it was missed. Due to that conclusion I figured I must of wounded it and decided to back out. I couldn't shoot a second time cause the willows she was in were way to thick. I turned around, walked back to where I shot from, drank a gatorade and 30 minutes later I went back for it. No blood trail, but ended up finding it behind the willows she stopped in. Ended up making it around 100 yards and the shot was better then I thought. A little far back but still got lungs. Bullet exited just in front of the hips in the paunch so I had to clean it out in a river. Save a tree, kill a beaver. Awesome. Congrats! Some great eating there. Hey, Congratulations, and thanks for posting the pics. 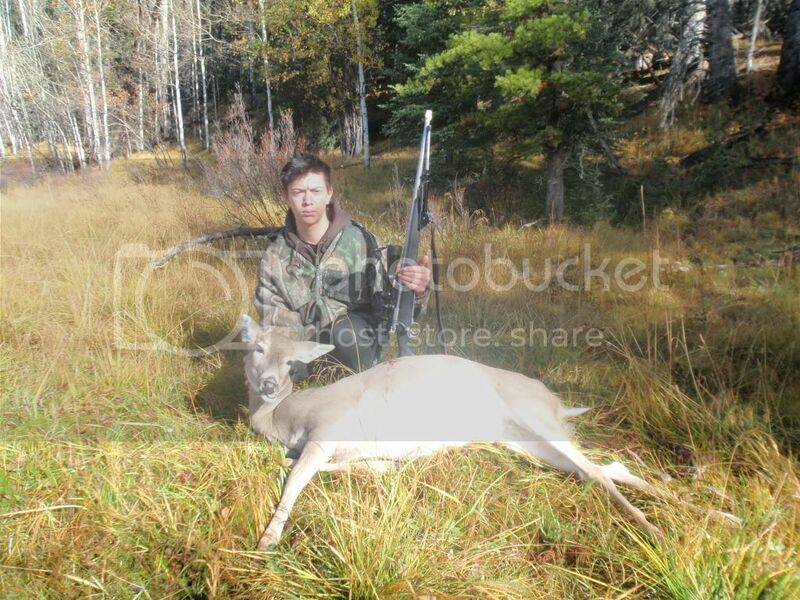 Nice looking doe. Word of advice..........smile and look happy...lol..
Good stuff moosehunter enjoy the eats.